Granby Four Streets Community Land Trust was created in 2011 to address housing issues within Liverpool’s Eighth District. 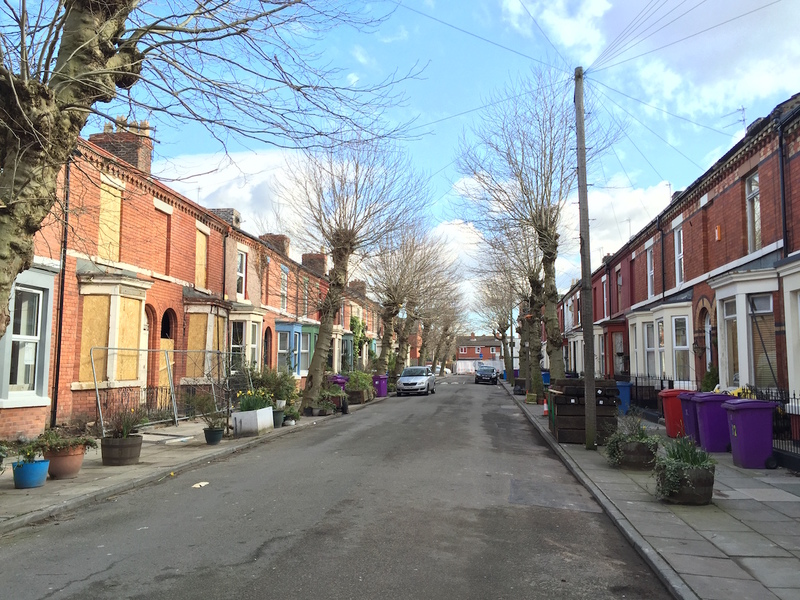 With the help of local activists, architects and social investors, the organisation managed to engage the Liverpool City Council as well as housing associations and cooperatives in a Community Land Trust scheme. In this scheme, the local community owns land and leases some parcels and buildings for various uses and development projects, keeping control over prices and ensuring long-term affordability and community benefit. What is the origin of the Granby Four Streets CLT? Granby Four Streets Community Land Trust grew out of a need for affordable housing and a response to dysfunctional housing policies. The Toxteth area of Liverpool was beset with particular problems like the lack of investment and unemployment. In the 1980s, Toxteth was a very politicised area, with a conflict between the state, the police and the community, which was exasperated by unemployment problems due to the decline of the industry around the Liverpool area and exploded with the 1981 riots. The development of the area was led by housing associations that began as small organisations but later they grew into massive institutions: there was a widening disconnect between the community and what the housing associations were trying to achieve. At that time, housing associations felt that there was no money for them in property refurbishments because of years of low to no investment in properties alongside the loss of subsidies from the Central Government to support less profitable properties and bedroom sizes. Another reason was the construction market being stacked towards new builds because of a raft of incentives including no VAT on new constructions, making demolition and new build a more cheaper and feasible option. This led to a proliferation of new builds, instead of renovations. Housing associations and the City Council thought they could cure the community’s ills, poverty and unemployment by building new homes, and they always saw the Toxteth area as a few streets that stand in their way. This “managed decline” led to a gradual devastation of the area, with 180 houses boarded up, with maybe five people remaining in each street. National housing policies did not help much either: the Housing Market Renewal Programme of the Blair years, a large top-down approach to urban regeneration ran in Merseyside in Liverpool worth of £650 million, whose aim was to rebalance the housing market through restructuring the housing stock in areas of high deprivation, worked essentially as a demolition programme. How did local communities react to this process? Some areas were more responsive and accepted this decision. But some areas like Lodge Lane fought back against the demolition plans. In the Granby area this fight was not so successful: Granby started getting demolished street by street. People were poor here and when owner occupiers were offered money to move out through Compulsory Purchase Orders issued by the Local Authority as part of the Pathfinder Programme, many of them took the opportunity. As for private rented tenants and Housing Association tenants, their landlords would have received the money, but it was not passed on. Street by street, many houses in the Granby area began to close down. Plenty of people from the neighbourhood had moved on or had been pushed out. Fortunately, within the four streets around Granby Street, there were enough home owners to stick their ground and stop the process. There was a group of activists, predominantly women, who fought the demolition programme and saved the buildings of these streets from demolition. 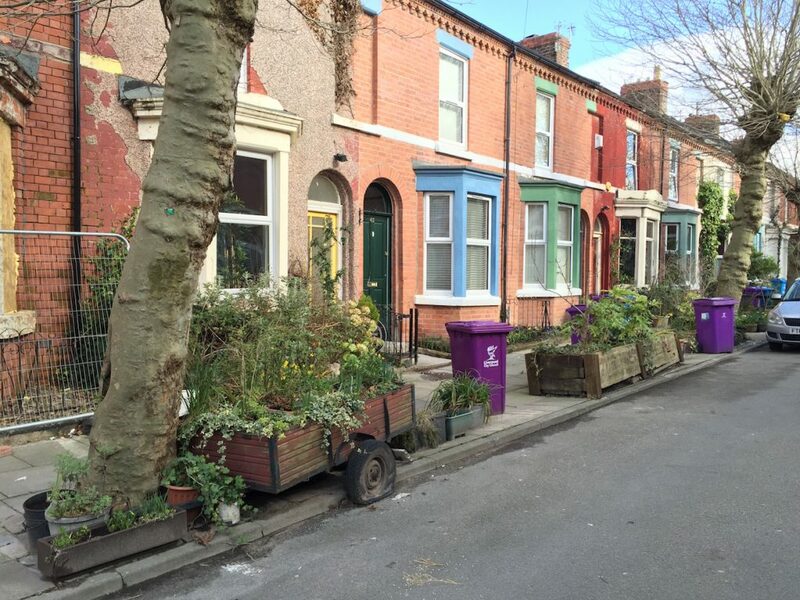 They moved away from the usual processes with the local authority at Liverpool council and began to take control of the area with very small-scale interventions. This meant gorilla gardening, taking care of the immediate environment themselves, playing about with the urban landscape with creative approaches. They cleaned alleyways that the council had not cleaned for years. They were tidying up and beautifying the area, simply for themselves. But people began to engage in conversations with them, and discuss about what was happening in the area. More and more small scale interventions followed: they started a market and began to bring out tables and throw street parties. One of the women said, “what is the point of sitting in your house?” They began to spend more and more time outside, and using the streets more solidified the community. This activism grew over about two decades. Over this period, these engaged residents and activists became aware about the other organisations in the area, and slowly but surely their skill base rose. It was just a set of volunteers, maybe 40 engaged residents creating spaces within the area, organising direct action such as guerrilla gardening, street parties and markets, painting tinned up properties, creating potential projects, which would prove that the area was vibrant and strategically important for Liverpool with regards to future regeneration projects. How did these activities influence official plans for the neighbourhood? These small interventions led to a more concerted approach to how they visualised their dream. While the vehicle for local self-organisation was initially the Granby Residents Association, originally set up by the housing associations in 1993, it ceased its activities in 2007. In 2011, some residents understood the opportunity created by the closing of the Housing Market Renewal Programme: they formed the Granby Four Streets Community Land Trust in November 2011. They met up with a few partners and began to draw plans together for an urban regeneration process with very small incremental stages, working on solutions that could work better than the large-scale interventions which had obviously failed. We approached some developers and the council to make sure our perspective was taken into account during any development. In 2012, the association won a small urban garden competition,this got noticed by the Steinbeck Studio and they came down to visit them. They saw what was happening in the neighbourhood, liked the idea of citizens being active in the community and Steinbeck offered a £500k loan. It is a loan facility at a very low rate, about 0% for the first five years and then 4% for four years, moving onto banking terms. This money allowed us enter into negotiations and raise match funding. From that moment, the Liverpool City Council began to take notice because we attracted private investment, but they had no money to do anything. The perspective of investment ensured that the Council had to sit down and begin discussions with us over the empty properties of which there were about 200 in the area. 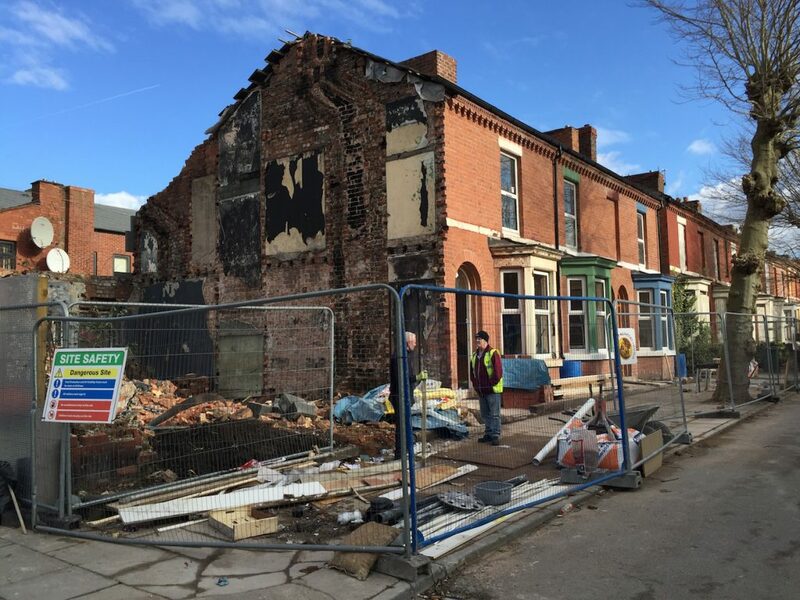 We finally convinced them to transfer 10 properties over to the Granby 4 Streets CLT and this was an important basis to take development in our hands. Why did you choose the format of the Community Land Trust to pursue your goals? Community Land Trusts mechanisms came out of the Tory government’s Localism Act which was meant for village halls, rural places. They saw these mechanisms as a way to solve issues in predominantly rural areas in the south of England. We were the first of urban Community Land Trusts. As housing associations and cooperatives did fail to develop the area differently, we were looking for other formats. A member of ours went to a cooperative meeting and came back with the idea of a community land trust. Because of the community’s problems of ownership, the idea of land trusts, of the community owning the land started to resonate and we set up the CLT in 2011. We received a lot of help from the National CLT Network: they gave us £10,000 to set up the organisation and we contributed to their learning and case studies. The Community Land Trust structure gives us a lot of flexibility: it allows us to create spaces that are applicable to the community, to be creative with the urban spaces, to approach development in a completely different way. It allows us to own land but also to bring other partners in, to lease out our buildings and parts of the land for fixed terms, to choose different types of tenure and attract further commercial and creative activity to the area. Within a cooperative structure it would only be the members of the cooperative who would be allowed to use commercial facilities, but with the Land Trust the entire community can use these buildings. There are now CLTs all across the country: there has been a re-invigoration of the format because of the alternative models developed in London. London is in a very different situation: the value of the CLT properties is in the tens of millions. They just try to cling on to their properties whereas we try to build as well. How can you guarantee the affordability of the spaces? CLTs can protect land from the fluctuations of land value: they lock their assets in a way that it can only be developed in a manner that benefits the community. The CLT holds the land in trust, separating its value from the building on it, and it can fix the price the buildings can be sold later: any value increase is locked in by the CLT for community benefit. The buildings we sell now for £99,500 are restricted on resale and are linked to the median wage level for Liverpool. Even if we are very successful in the next five years and the market in L8 increase, the sale value will only grow by 2 or 3%. In essence we cut out the profit motive. You cannot come to this street thinking that you can live here for five years and then sell and make a healthy profit. It will be up to you to ensure that this community stays this way. You would think, who would go for that? But as mentioned we had hundred expressions of interest. People do want to live in this way. Actually what the area needed was people living here, not the commodification of buildings. What partners do you work with in the Granby area? We convinced the Council to work with a variety of developers instead of a single one: we got on board the housing associations Plus Dane and Liverpool Mutual Homes and the housing cooperative Terrace 21. The ethos was that one large solution had failed to regenerate the area so a number of smaller solutions and partners could work together to provide a variety of options. It was essential that we brought other people in to manage the projects: these cooperations assured a diverse program for the area and also helped us attract funding from a variety of sources like from the empty homes grants scheme of the Nationwide Foundation. Now we share responsibility among housing associations, private homes dotted around, the cooperative, affordable homes and the CLT: this is a good mix of tenure, it gives us many options. Sharing the risks and responsibilities as well as sharing the funds, skills and opportunities is a better approach in designing the immediate urban spaces and the refurbishments of the properties. How do you conceive the refurbishments: what is the future destination of the buildings you manage? 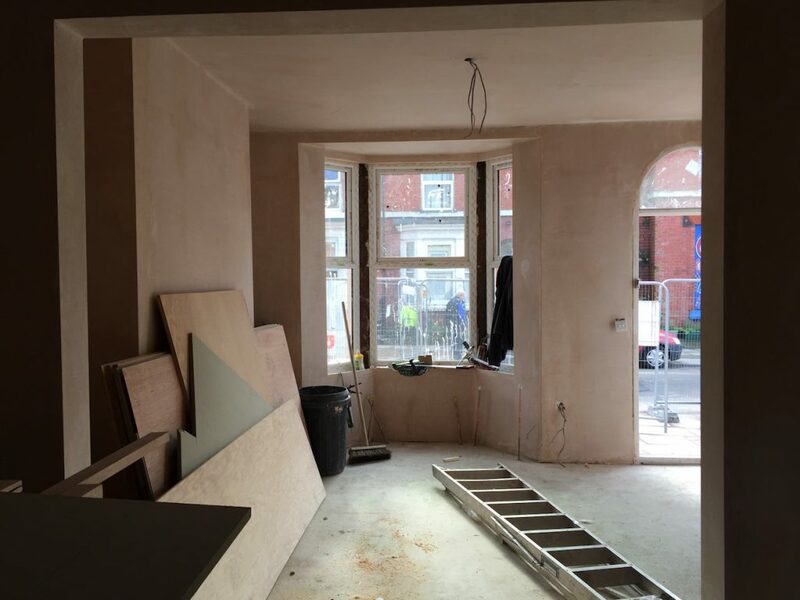 We went on site and began to renovate buildings at the end of 2014, and we should be done by the end of 2017. 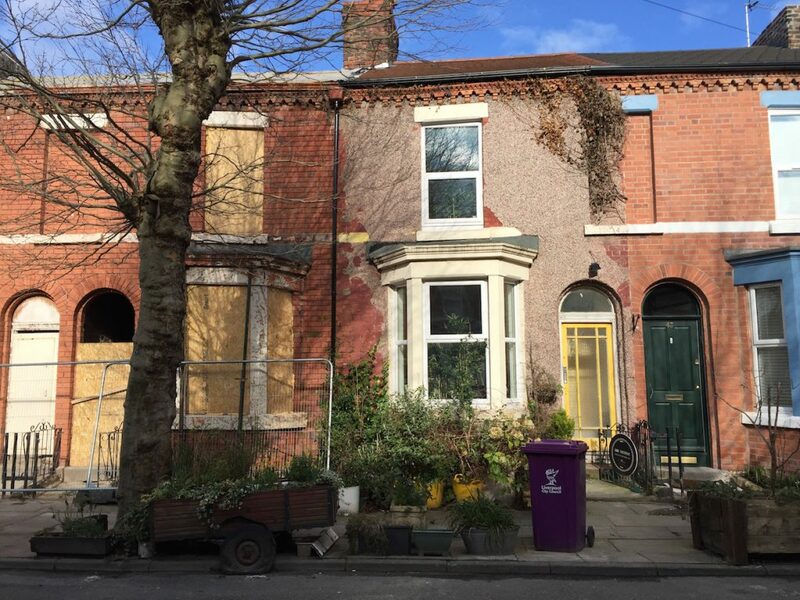 We are renovating 11 Victorian terrace houses on Cairns Street, six of them for low cost ownership (£99,500, well under the market rate) and five for affordable rent. Other two buildings will host our Winter Garden, a community-run indoor garden with artist studio, community meeting space and Air BnB. We are also in the early stages of planning a Four Corners project, which will bring derelict retail space back into use, commercial space that has been abandoned for essentially 20 years. We have occupied one of the spaces and we will be consulting the community further on this. Some units will be for the people to use in the area in whatever way. We want to continue with a different approach. That allows us to draw in as many people as possible so you are not seen as an island of elites or exclusives. There are still massive social problems here. We cannot solve all those problems, but we can draw in young people. We need to have a strategy to use the shops. What is in them for the community? It cannot just be simply someone renting a shop. It would be nice to use these units on a multiple occupancy basis. They should be used as a springboard for young people, whether to do with arts or creativity or training and education. It might sound snobbish, but we did not want a pound shop over there, we wanted the community to aim higher. That means creating the space and the assets for people in the community to benefit from, and our community street market is key to providing the users of these shop units. The Turner Prize nomination in 2015 gave you a lot of visibility. How did it change your project? It was a big turning point: after Assemble received the prize for their work in Granby, they only accepted it if it was shared with the CLT. The Liverpool City Council enjoyed the attention, they eased their fears and began to speak to us as equals. The prize and the cooperation with Assemble also allowed us to develop new ideas, to widen our ambitions, to be more creative with urban space. The ideas they came up with were simple. No glass facades, no demolitions but things the community could understand. Many buildings were in really bad condition. Assemble produced drawings about what they could do with the empty homes. The original designs were absolutely fantastic, we worked with what the community liked. People said ‘these are the first people who listen to us’. Assemble were key in the initial kick-start of the whole process. Their designs were exciting for the community but also for other investors, so we could tap into a grant called Empty Homes with which the government was trying to get people back into their homes. The concrete offshoot of the prize was a social enterprise, the Granby Workshop initiated by Assemble, which started off as an idea to produce bespoke items to make the homes unique. We created a space for them to work within the community: it grew into a very successful social enterprise within three months. How did these evolutions transform the CLT? We met many people during the years and we learned from them a lot. While a third of the board is made up of people who live in the area and another third from the wider Liverpool area, a third are people who we think can enhance our organisation such as council officers, members of Assemble, members of the creative industries. Through encounters with them and others, and by osmosis, we took on many skills. For the people in the area who do not think they have the skills, it is a good way to underline the fact that that of course you will learn competencies, of course you have the capacity to engage with this. As a group of essentially non-professional activists, we learned to varying degrees about housing and regeneration. I remember seeing one of our members going into a meeting, not knowing much about it and not having a lot of competencies in leading a development group but three months later she knew everything about it. People who are in charge think communities do not know enough about the complexities of development, but that is not true. How do you evaluate the impact of your activities in the area? This area has now become more visible within the public eye in the wider Liverpool area, so we can see people constantly streaming through, people who want to live here. It is nice to draw people into the community, or for people to come back who have been forced out. We have not just attracted financial investment but also attracted people who would never have thought to move here and see its potential. Liverpool had a brain drain towards the south but now we are attracting people back. What is the scale of the CLT at the moment and what are your perspectives of growth? The Community Land Trust currently owns 14 properties: the idea is that being a landlord and owning the land in the area, no decision can be made by the council without us anymore and most decisions will have to flow through the CLT, and we will not be represented by housing associations and social landlords but will be at the table. We feel this set up provides more equal terms with Liverpool City Council and housing associations. Hopefully it will make the process more democratic. We never wanted to be a housing association or a registered social landlord. We see ourselves utilising a network of assets within the community. We proved ourselves to be a viable organisation that seems to be working at this point, but we have to solidify our relationships. We do not want to go beyond this area. It would be nice to have a network of similar groups around Liverpool and extend that to similar cities in Europe. I think this is the way forward, but there are many risks in the process. In the gap between the initial stages and realising a project, between when a community identifies with a land or property and when it gets organised and puts finance in place, costs arise exponentially. There needs to be a mechanism, even if it is just a sort of a bridging mechanism, to ensure that community can secure building rights or land rights immediately and then they can build their business plan towards it. This is the most important thing. Community, Economy, Liverpool , civic space, commerce, commons, community, community land trust, cooperative, ethical bank, finance, Funding the Cooperative City, green spaces, heritage, housing, neighbourhood, ownership, social investor, work.